Can a New York wife of 28 years enjoy a new life after her insufferable husband leaves her for a younger woman? Manhattan speech therapist Maggie Strickland is shattered when Harold, a philosophy professor, abandons her for one of his comely graduate students and sues for divorce, employing a prominent law firm cozily known as “Slam Dunk.” Friends like former Mouseketeer Janine Bookman try to boost Maggie’s deflated ego—that is, the ones who haven’t taken Harold’s side or informed her that she’s too needy to be their friend any longer. Depressed and overindulging in ice cream, Maggie gets no help from her family. Daughter Allison is an intimidating yuppie control freak with little time for her bruised mother. Fickle son Brian announces out of the blue that he has married a woman with a small child and aims to help run her cookie business. Mom, who meets Maggie once a week for a tuna-fish-sandwich lunch, is a punishing kvetch and sadist who delights in reminding her daughter what’s wrong with her. Visits to a sympathetic therapist, Rabbi Jennifer, help Maggie sort out her tangled feelings. She valiantly tries dating a man she knew in high school, but Tony Carlucci, refashioned into the very flashy, wealthy Anthony Sinclair, turns out to be uxoriously attached to his estranged wife. Loathsome Harold finally proves too exacting even for his young squeeze, but by this point, Maggie recognizes that she’s far better off without him. 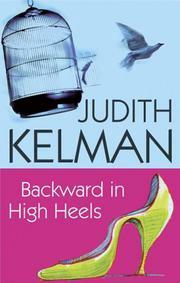 In this uncharacteristically lightweight trifle from accomplished suspense novelist Kelman (The Session, 2006, etc. ), the one-liners come fast, especially the Yiddish put-downs from Maggie’s over-the-top mother. Predictable, but Kelman’s work is as tight and smart as ever.